First, I would like to convey how grateful the Tasman’s are from all the messages, and support that have come in so far. I know they haven’t been able to respond to everyone but they want to thank everyone for their words of encouragement, support, and willingness to fill any need that has arose during this challenging time. Thank you doesn’t fully convey what they’ve felt from your support. At the bottom of this text you’ll find a summary of the bullet points known as a [TL:DR] (too long, didn’t read). I know sometimes we just want the facts so we wanted to make sure that anyone who wants the facts can get at the bottom. Joshua, Jenni, and Ezra’s journey truly began near the end of last year. When Joshua had heart surgery the day after Christmas (18’) to replace a heart valve. Shortly after that (Feb 19’) Ezra had a bad case of bronchitis hospitalizing him for two days. Now they find themselves in the hospital again, this time with Ezra fighting for his life, because of a cancerous brain tumor. 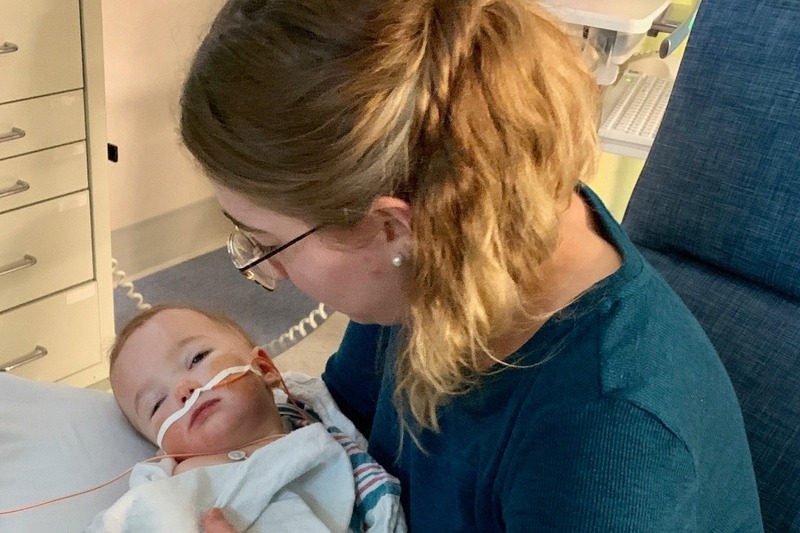 Early last week, Ezra began vomiting constantly for 48 hours. Initially they had thought it was related to hitting his head a day prior and that he may have a concussion. 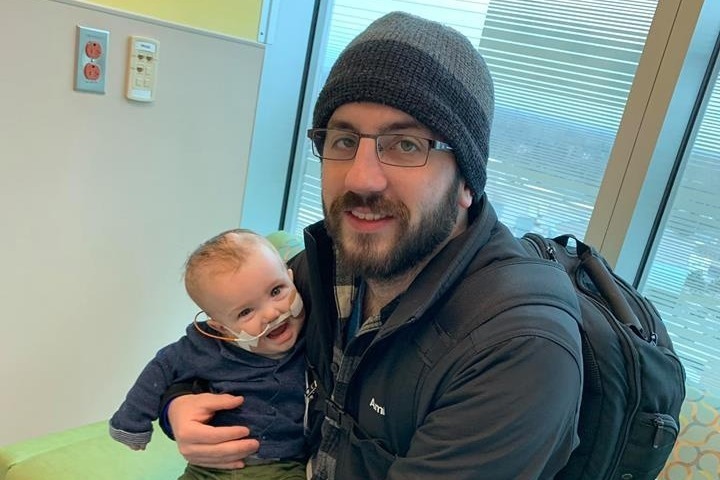 When meeting with their pediatrician he immediately noticed Ezra's fontanelle (soft part of an infant's head) was bulged opposed to sunk as it should, and ordered an emergency CT scan. 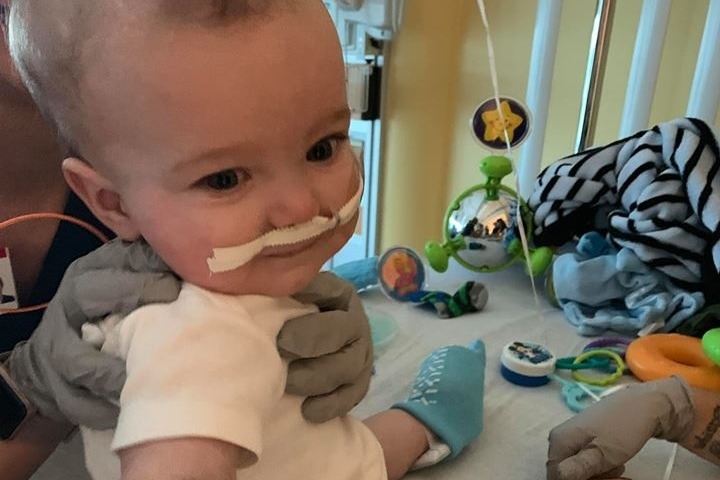 On March 12th 2019 - 9 month old Ezra was diagnosed with a brain tumor and had severe swelling of the brain. The following morning Ezra began, a 2 part, 12 hour surgery to relieve pressure and remove the tumor on his Cerebral Cortex and Brainstem. A small step forward in his fight. March 19th we were told that the tumor was found to be a rare, aggressive form of brain cancer called Atypical Teratoid Rhabdoid Tumor (ATRT). This form of cancer requires quick and intense form of chemotherapy as the cancer has the ability to re-grow to its prior size within only a few months. As Ezra recovers from his surgery he will begin rehabilitation therapy, directly followed by chemotherapy treatments. This plan of attack is aimed at stopping the re-growth of the cancer and putting it into remission. Due to the rare form of tumor that this is, they only have one suggestion for treatment that is quite new. We are hopeful for its success but it is still a new procedure with many unknowns. This is where I ask for friends, family and our community to step in. We together can help alleviate at least the financial stress Josh and Jenni have had since Ezra began this journey. 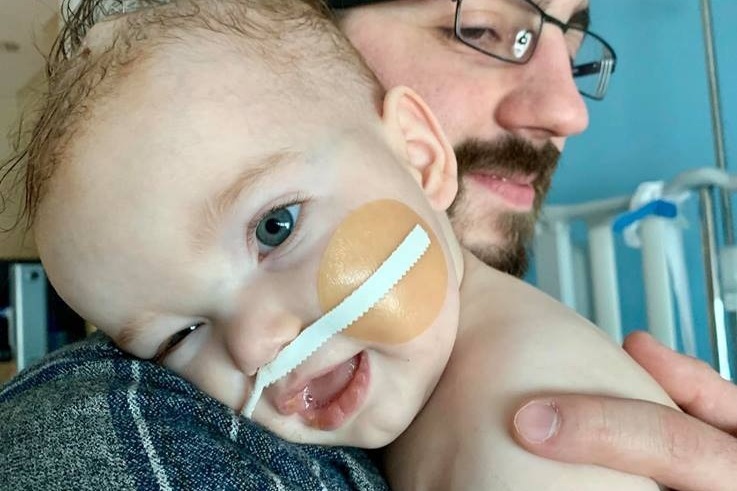 With Josh's unexpected heart valve replacement surgery and recovery, as well as Ezra's stay in the hospital in February, the Tasman's have spent over $20K in medical expenses over the last 3 months and will have to owe tens of thousands more during Ezra's treatment. We don’t know how long this journey is going to be, we can only hope for a speedy, and successful treatment. The team at DeVos Children’s Hospital have been careful to only share news that are supported by facts, and continue to remind us all it will be a journey to be taken one step at a time. Any amount that you can afford to give will be going to help care for a generous family that could really use the support. The love, support, gifts and the encouraging messages these two have received have been crucial. Trust me when I say, they have needed every ounce of care so many of you have put forward. So on behalf of the Tasman's, thank you so very much. A lot has happened in the past 36 hours, so here is a quick update on our little boy. Ezra started had a procedure on Tuesday to get a broviac placed on his chest, which acts as a port for his chemo to be administered and as a port to draw blood from. This prevents him needing an IV every time we’re admitted to the hospital. Unfortunately, the broviac they wanted to place was too big for him, so he ended up with a smaller type that only has one port rather than two. That means he may still need an IV every admittance if he’s getting two drugs that cannot go in at the same spot. Hopefully that won’t be too often, because they really have a hard time finding veins on him, since he’s so tiny. During the broviac placement, he also received his first dose of Chemo through his ommaya (the port on his head). He then started his chemo treatment the next day (Wednesday), which was a cocktail of three heavy drugs. His chemo cocktail was administered again today and will be done again tomorrow. So far, he has done great. He’s still smiley, laughing, and seems to be very comfortable. Before he started chemo, we had to sign what seemed like a million consent forms that stated all the possible side effects, which was awful. We’re praying he flys through his treatment with no issues and no lasting problems. His treatment plan currently looks like 3 weeks in the hospital and 1 week home every month for the next 7 months, so we’re, sadly, just getting started. Ezra’s rehab has been going great. It’s amazing how resilient he is. He’s holding his head up more and he even started to roll over again. Every day, he’s getting better and better. On Friday, we’ll be leaving Mary Free Bed to finally head home as a family after a month long hospital stay. We’ll be back for Ezra’s first round of chemo next week, but we can’t wait to be home even for a little while. 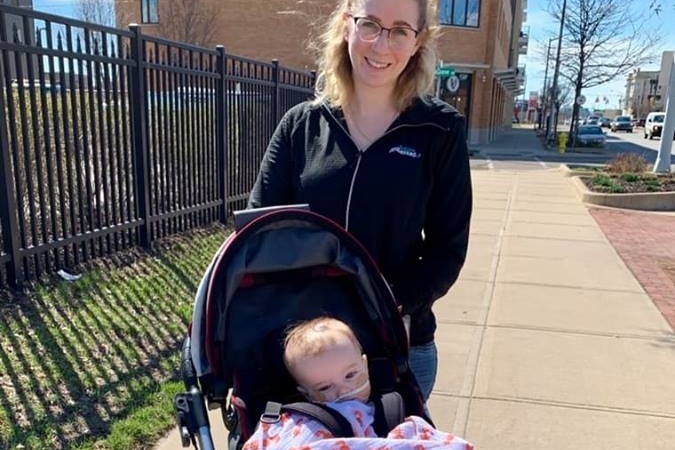 Ezzie also had his first stroller ride outside of the hospital today and he loved it. Yesterday, Ezra was moved to Mary Free Bed to start rehab. He’s had a few therapy sessions, but he’s going to start a rigorous schedule to get him moving around again, before going back to DeVos. He’s much happier here, since he can play more and he doesn’t have to be hooked up to a bunch of monitors. That being said, it’s a bit more stressful environment for Jenni and I, so prayers that we’ll all get some much needed sleep would be appreciated. Also, a couple days ago, Fox17 did a story on Ezzie. Check it out if you haven’t to see some cute photos and videos of him. Link to Ezra's news segment below. Today has been such a great day. After almost three weeks, Ezra finally had his EVD removed, so he no longer has a tube poking out of his head. His lumber puncture labs also came back saying there are no malignant cells in his spinal fluid. This is really exciting because that means he’ll have one less round of chemo. 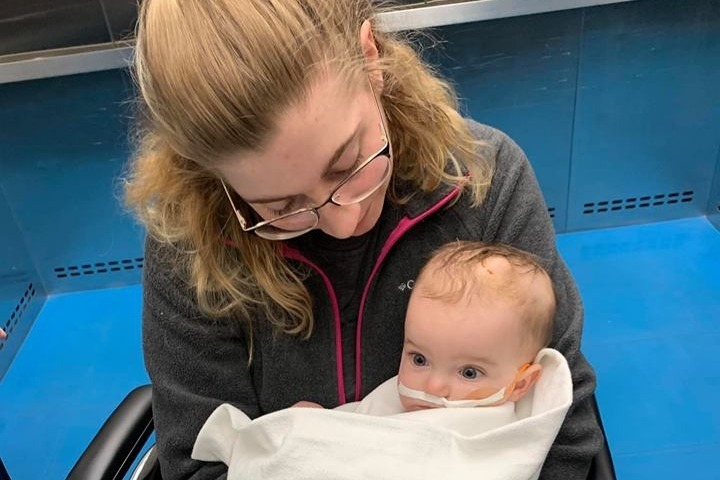 If everything continues as planned, we will be moving over to Mary Free Bed soon, so Ezra can start learning to Crawl and move around again. Then in two weeks, we will be back at Devos to start his first round of chemo. If Ezzie starts hitting his milestones right away, hopefully we’ll be able to go home in between, time will tell. Also, we can finally hold Ezra upright and he loves it.